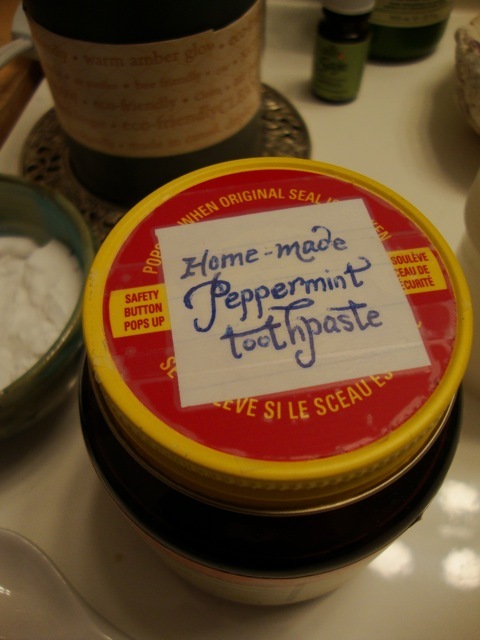 Two zero-waster recipes in this post: Toothpaste, and Crackers! The first is a recipe I tried in March, the second, i just made today. Both successful and tasty. From the book "there's lead in your lipstick". The most unusual ingredient is vegetable glycerine. 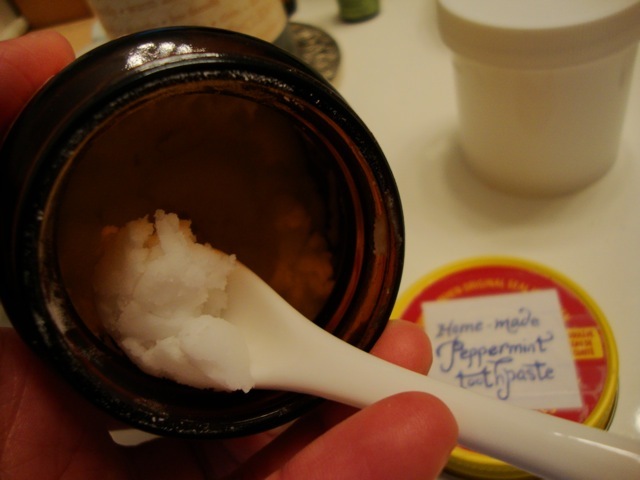 It’s a big step up from dipping a damp toothbrush in baking soda! These tasty morsels took about 45 mins, start to finish, and they are pretty idiot-proof. Mix dry ingredients, add oil & mix with spoon, then pinch/mix with fingers until you have a well-combined sandy texture. Add water and combine, kneading 4 or 5 times to finish. Divide into 4-8 pieces, cover with tea towel and let rest for 15mins; turn oven to 450F. Roll out on lightly floured surface – a rolling pin works fine, but a pasta maker does a fancy job. Score with knife or pizza roller. Lay on cookie sheet and (optionally) brush with olive oil. 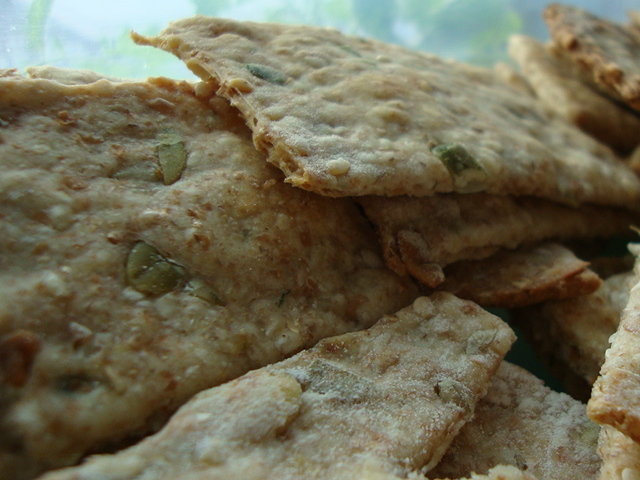 *For thin snacking crackers, roll 1/16th” thick, bake 4 min on one side, flip & bake 2-3 more mins. *For thicker dipping crackers, roll 1/8th” thick, bake 6 mins on each side. You may have to play with the baking time a bit to get the ideal toasty crunch you prefer; the nice thing is that these crackers still taste good either slightly undercooked or slightly overcooked. that’s my kind of recipe! As spring time arrives in nunavut, mud and gravel emerge. But those aren’t the only things the melting snow reveals, and much of the junk is recyclable. Giving a new meaning to recycling taking flight. And Durazio says she’s not the only one taking recycling south, or taking their own initiative. 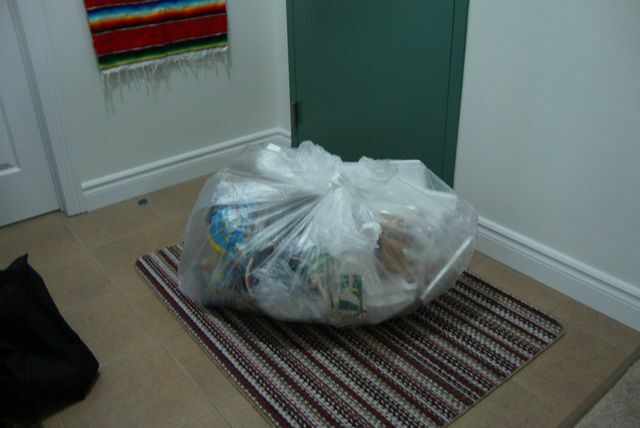 Arctic co-ops limited is beginning its own recycling program in communities. Northwestel started a phone book recycling program in Iqaluit schools this month. The government of nunavut had a recycling program going for a while, but cut it off last December. “It was a matter of cost decrease in our recycling program and our department in particular, you know, couldn’t afford to continue it.” Badalloo says it’s very expensive to recycle in the North, because of how much it costs to store it and move it south; but he says the government is working on a strategy. Until then, people like Durazio will continue to take recyclables south by the suitcase. Jessie Fraser CBC news, Iqaluit. We’ve been at this waste reduction project for just over 3 months now, which is a quarter of a year – time for a quarterly tally. Organic waste: we produce 5-10 lbs of organic waste every month, possibly what we would have produced in a week when we lived in Vancouver. Because I’ve still not gotten my “grow room” set up (if you know of my plant-growing obsession, this will come as a major shock), we don’t have a whole lot of green waste. We also don’t eat as much fruit as we would down south since it’s so expensive and I still haven’t started a food mail routine. 3 month ORGANIC TALLY: about 25lbs *note: luckily, we have a local non-profit composting pick-up program (wonderful, amazing, fantastic) for compost while we continue experimenting with do-it-ourselves compost-at-home systems. The first Bokhashi trial was decidedly a “fail”. More on that in a separate post. Still no worm bin trial – need to trade pie for worms with a friend first. Non-Organic Waste: apart from the moving garbage, we have not thrown anything out. We have repurposed 30lbs of combustible paper & cardboard as fuel to friends who heat with a wood stove. Everything else, we have been segregating as if we had a recycling program. Aluminum: 3lbs of aluminum (including a .5lb roasting pan with holes in it, and small-ish bits of alfoil that we imprison inside squashed soda cans before we crush them). We intend to appeal to the ex-beverage can recycling guy with these, since we have heard rumors that he may still be interested in accumulating them for the future. Assorted metal and glass: 15lbs, including three large glass apple cider bottles and some wine bottles which may be re-purposed at some point in the future. Also includes four #1 plastic deli-sandwich cases. Non-recyclables: 7lbs, consisting mostly of soft, un-numbered plastic or shrink wrap, a couple of styro meat trays, broken dishes/glass, and our as-yet unrepairable popcorn popper. What I didn’t measure: we are re-using some yogurt containers, pasta jars, wine bottles, cans, and plastic bags. In coming months, any more accumulation of these items will be beyond our capacity to make use of them, so we will have to add them to the recyclables tally, or avoid them altogether. – changing our cooking practices, dietary style, and eating preferences has saved us a LOT of garbage / accumulation of plastic. I have blogged about making more meals from scratch. Making our own bread has saved us at least 15 plastic bags; eating less yogurt, not buying juices, and making up powdered milk & hummus has probably saved us 25 milk/juice cartons, 8-10 yogurt containers, 5-6 hummus buckets. 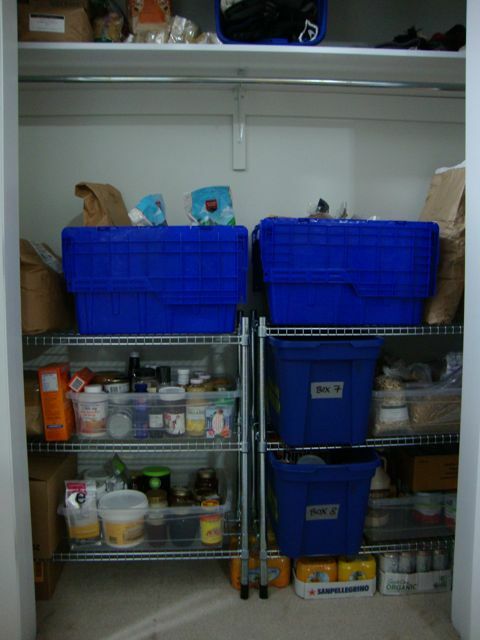 – 70-80% of our food comes from “pantry ingredients”, purchased in bulk, and many packaged in paper bags. This makes a HUGE difference in waste and food costs; it is something I think we will continue to do even when recycling is more available and convenient. in love with our pantry. The answer to Jesus-toast? 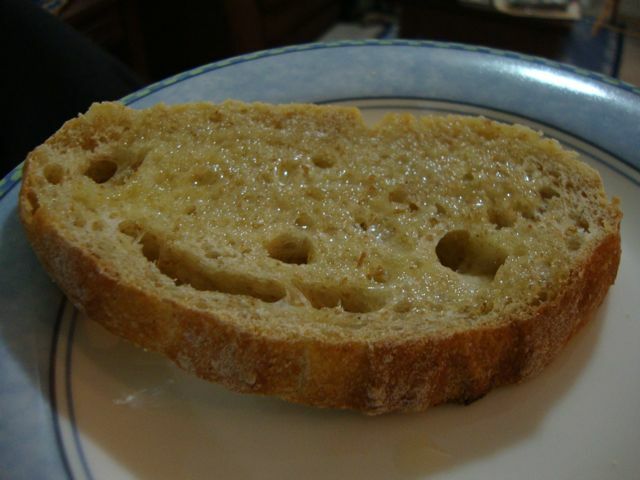 Quatchi in a slice of home-made bread. Notable Disappointments: I would call this category “opportunities” if I was at work… but I’m not, so there. – we have not done a great job avoiding shrink-wrapped cured meats and cheeses, tofu, or things with little ‘disposable’ waxed, metallic, plasticised doo-dads. Partly that’s because there aren’t a whole lot of options in food-buying up here. Mostly, it’s because we aren’t willing to go full vegetarian when we have so few fresh vegetable options. One can only eat so many beans, rice, lentils, grains and nuts with handfuls of sprouts and grated carrots before beginning to wonder if it’s the lack of daylight or the lack of green vegetables that’s so depressing. 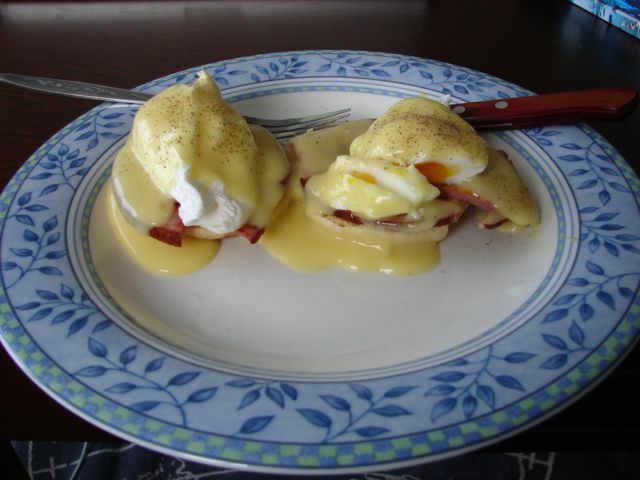 We have almost eliminated poultry and beef, but ham/bacon/salt pork with bean dishes has become a minor staple, along with plenty of eggs, cheese, and powdered milk. – We still don’t have an efficient or appropriate solution for our recyclables, and we’ll be continuing to store them for that reason. Surprisingly, when my sister offered to take home recyclables in her luggage after her visit, I discovered that we have somehow managed to avoid accumulating much recyclable plastic. She filled empty space in her luggage with some hard vitamin bottles, a couple of sandwich trays, and a couple glass beer bottles. I know this is not a sustainable solution… yet I can’t help feeling a bit better knowing they are going to be recycled. I fight the urge to feel guilty about transporting these things by air with the factual assertion that flights to and from Iqaluit are rarely full, and that inefficient use of fuel on empty flights far surpasses the few ounces of hitch-hiking recycling cargo. – Today I threw a styrofoam clamshell take-out container in the trash at the Baffin Deli. Major conscious effort; major moment of weakness. Worse, afterwards I saw real dishes in the kitchen that I may have been able to request my food served on. I also suspect there are more rigid sandwich containers and juice cans that *don’t* make it home from work with T. Must work on home-made lunches and self-control. Tally-ho! 67 lbs of waste, 7 lbs (~10.4%) of which is non-recyclable. Extrapolating to a full year, and adding an extra 12% to avoid under-estimation, our “total annual household waste” might amount to 300 lbs (150 lbs each, or about 0.07 metric tonnes). Take that down to 15.6lbs each annually if we could only recycle the recylables! There are many admirable “zero wasters” out there that would be shocked at the large-ness of 150lbs annually, yet according to these numbers, 150lbs is only 6% of the garbage that the average Canadian produces annually. I give us a “somewhat satisfactory” grade so far, with plenty of “room for improvement”, especially in reducing our non-recyclable plastic garbage. A friend asked me about pets up here – she said she was reading this blog when her cat interrupted her by scratching around in its kitty litter, which made her wonder how the heck you would deal with pet-related-things if you were trying to live waste-free. On dog poop: There is a school of thought that asserts people should NOT pick up their dog-poo with little plastic baggies and put them in the trash – that in fact, your dog’s excrement is much better off being rained into the ground and becoming part of the natural cycle of things (or being baked dry and crunched into dusty smithereens). This is an interesting point, but when I’m walking on a sidewalk in the city or trail-running in a park and my foot lands in a pile, I really don’t see anything naturally cyclic or life-giving about it. There is a more community-friendly alternative, if you happen to have a small piece of land (I’m talking 4 square feet). You can get a “solar cone” which is an airtight, insulated, cone-shaped composter. It comes in two pieces – a perforated basket that you dig into a hole in the ground (surrounded by chicken wire if you have a local tunnelling rodent population); and a top cone whose lower lip also gets buried a few inches underground. The airtight lid on the top of the cone allows you to dispose of typically non-compostable waste like cooked and raw meats, bones, dairy, cooked breads & veggies and … pet poop. Once the basket is full and the contents sufficiently decayed, you dis-assemble the cone, dump the basket contents into the hole, fill it in, and make a new hole. Your cone may only need to be moved after several years, depending on the water content of the waste you put in it. On pet food: There’s a lot to say about pet food and waste. There’s the conversation about the trashy contents of most pet food, and how if you really really love your pets you will either spend lots of money on higher quality food, or even make your own. I’ve got two northern examples for you on ways to avoid paying the very very very expensive price (financial and health-related) of manufactured pet food in the North. 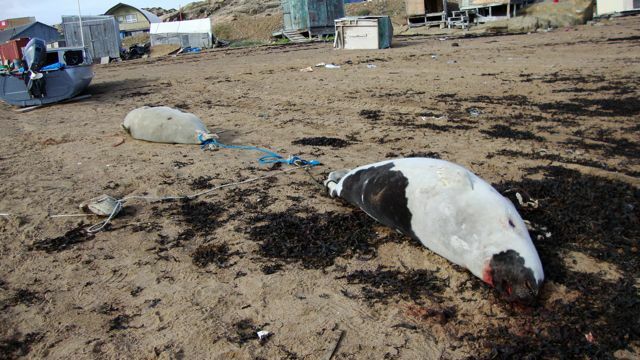 When I asked about these two seal that had been sitting below the high tide line for at least 8 hours, I was told that bearded (actually Harp seal, thx for the edit, Clare) with dairy-cow like patterned fur as opposed to the favoured ring seal with lovely spotted fur, are only good for dog food. [the person who told me this was not looking at the seals, which brings me to wonder which seal it is that he thought was “only good for dog food – harp or bearded?] Some people feed their sled-dogs with seal. That’s pretty low waste – a couple of spent bullets and less fuel in the outboard than is used to fly bags of dry food made in Asia up from Ottawa. If you’re more of a lover than a hunter, you can do what Ms. Muise in Qikitarjuaq does for her lucky dogs: make your own dog food! Keep an eye on that blog for more experiments in canine cuisine. How do you deal with pet-related trash? You know, coffee surprisingly causes quite a few waste-free dilemmas. It really doesn’t have to be that way. Use a re-usable mug when you buy it “out” and pay attention to packaging when you make it “in”. That should be pretty simple, right? Yet, here I find myself posting another blog entry about the waste dilemmas of coffee. Cost: The machine itself is crazy expensive for something that is engineered to heat, then drip water. Then there’s the cost of the coffee, and the fact that because the cups are patented, the proprietors have a monopoly and you have no choice but to pay up. You pay more, not for better coffee, but for the layers of plastic it comes wrapped in, and for the (hilarious) pleasure of not having to undergo the tortuous task of using a tablespoon to scoop and dump grinds yourself. Freshness / taste: For something that is essentially instant coffee, and that comes in flavours like “donut shop” I find this point pretty laughable; but let’s humour it, because I had a coffee freshness brainstorm a while ago as well. Here’s how I solved it. Convenience: You don’t want to wash your coffee pot, or tip your filter into the garbage/compost. I understand groggy mornings, but… that’s a bit lazy isn’t it? You still have to wash out your travel mug at the end of the day. BTW, vinegar through the brewer works great – or use a french press. It’s so easy. “It’s Less Wasteful”: The reasoning that REALLY makes me laugh is the argument that these machines are less wasteful because you don’t waste grinds or pour leftover coffee down the drain. Really? let’s think about that for a second. Really????? I find this so ridiculously ironic. Sure, it’s easy to make too much coffee, which ends up getting stale in the fridge, or down the drain, or giving you stomach cramps because you drank far too much of it. It’s also pretty easy to not make too much. A good solution is to use a french press which is infinitely volume-adjustable, uses no filter paper, cleans up easily, and doesn’t need to be plugged into the wall. You can also make some pretty wicked mocha-chocolate-fudge-sauce for your ice cream with the extras if you still can’t drink it all. Embarassing: Am I alone in feeling embarassed that North Americans are so susceptible to convenience-based advertising and pretty countertop trinkets that they would adopt this trend with enough vigour to make Keurig one of the few companies doing well during a recession? Redemption: Never fear, if reading this has given you pangs of buyer’s remorse, I have a happy solution for you. You can go back to drinking real coffee including non-Keurig-approved brands if you like (even fair trade or organic coffee if you really want to remove some greenie-guilt). You can keep it fresh between your single servings even if you buy it in bulk. You can keep using your K-brewer. Thank goodness some reasonable person invented this dear little thing. My mind is at rest now that I know there is a solution for the Keurig, a ridiculous machine of garbage-birthing nonsense. Now go get a re-usable K-cup for your Keurig so you can be on top of all the new trends and still avoid producing unreasonable amounts of single-use-plastic garbage. Then pat yourself on the back for doing one more thing to cut down on your waste this week. no styro tray, no cello wrap, and a whole lot of beef! Yes, it’s $13.19/kg, no it’s not ground sirloin, and no it’s not organic. so … some serious weak points there, but the focus of this post is waste free greatness and I count this as a win! Beans lentils grains and nuts for protein allow us to get by without a whole lot of meat. We use soybeans but not much tofu because it comes in small quantities, wrapped in plastic, and is not always that fresh. In three months we have consumed one ham (soft plastic wrap – worth it), 6 sausages (tray, cello, etc – definitely not worth it), and 1/4 turkey (tinfoil tray christmas leftover, totally worth it). I maintain that I’d probably be fine on a vegetarian diet, with some iron supplements perhaps. The man on the other hand, maintains that he needs meat. This leads to a conundrum when we go to the grocery store and gaze sometimes longingly at the meat section. I can tell he kind of wants to pick something up, we both despair at the packaging. Up here, the grocery meat is either standard factory style meat, or it’s delicious fresh off the land meat that you hunt and butcher yourself. Really, with the beautiful home canned salmon that we have in the pantry, and the opportunity to buy flash-frozen char and turbot from just a couple hundred km up the island, we should and could easily just avoid red meat and poultry all together. In fact, the more I sit here and write, the more I am confirming that feeling. HOWEVER, for those Iqaluit residents (Iqaluimmiut? Iqaluites?) 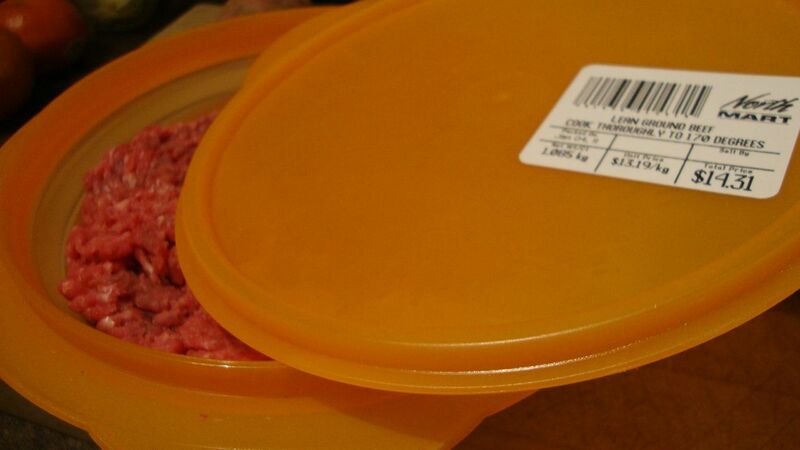 who regularly purchase meat, can’t or won’t give it up, and hate having to throw away those styro trays, cello wrap and meat-maxi-pads, this post is for you. The butchers at North Mart have a nice little window over the meat display that you can knock politely on, and request a cut of meat in your own clean container that you have brought from home. I was nervous about doing this, thinking they would question me, look at me strangely, or flat out refuse. None of the above occurred. It took a little bit of time, but the butcher in fact took a few chunks of meat he was trimming and ground them fresh right then and there! How wonderful! This has made me want to go back and bravely request some specific cut of meat instead of asking for what I could see he was already working on. And as for the spoils? Wednesday’s spaghetti-with-meat-sauce was delicious, the weekend Lasagne-making should keep us in lunches for a month, and the chili will taste great after skiing if we ever get our snow back and our butts outside! Next on the list of challenges is to finally look into this food mail thing. Perhaps the organic humane beef in butcher paper will not be so impossible after all. I had a suggestion to write about what Christmas is like up here – is there a traditional non-christmas holiday? How is Christmas different up there? Are people just as crazy-consumeristic about Christmas as they are down south? Is it fun? What does this mean for the whole waste thing? This post isn’t purely waste-related, but it might be interesting for a change. First, a bit of background: Iqaluit is a pretty multi-cultural and multi-religious community. The numbers say that between 65 and 80% of residents are Inuit, the rest comprising many ‘newfies’ and Quebecois, with a smattering of Ontarians and less folks from Manitoba westward or other countries. Many of the cabbies seem to be newer Canadians that found their way to Iqaluit via Montreal from pretty warm countries. They have their own micro-communities and represent several different minority (up here, anyway) religions. Among the Inuit residents, as is typical in many “frontier towns”, I would say that the colonial christian missionary influence gained an early foothold, and maintains it still. There are several places of worship in town, but since I don’t attend any of them, I can only say that I am aware of those I pass frequently on my walks – a catholic one, and an anglican one which is shaped like an igloo. There is a strong Roman-Catholic-Philipino community here, and an active south-asian-indian community (several faith groups). Q) Is there a traditional Inuit non-Christmas holiday? A) I haven’t heard of a holiday that I would categorize as a direct alternative to Christmas, but because Christmas evolved from the attempted displacement of the many other cultural celebrations related to solstice, midwinter, or other festivals of light and/or darkness; there is a natural, ancient, spirit of celebration around the return of the light that you could say is related to christmas and that is alive and well up here. (One of my favourite blog posts from Clyde river about the sun’s return.) In Iqaluit, we don’t ever completely lose daylight. A bit more northward, the community of Igloolik has an annual return of the sun festival including traditional cultural activities and performances by their resident circus troupe! Q) What is Christmas like up there? How is it different? One thing that seems strange when coming from a larger city is the inordinately HUGE amount of radio air-time that is dedicated to call-ins from anyone who wants to pass on Christmas greetings in the week leading up to, and following (! ), Christmas. For days while I made christmas cookies, I’d have the CBC on and there would be hours and hours and hours of families leaving messages (Inuktitut smattered with expressions of “merry christmas” “I love you” and “I miss you”) for each other. From this, I can see that the true spirit of Christmas – that of togetherness, love, and goodwill – is alive and well up here, and that it’s a really important time of year for family. I’d even venture to say I can “feel the love” more tangibly here than down south. There is also a really nice community feeling of inclusion. I felt this at holiday parties where as a newcomer, I felt very welcome. I also felt it at the Christmas Games. Q) Are people as Christmas-consumeristic? (2) the higher incidence of poverty leads to a less obscenely consumerist display. As you may have gathered from this post, some people spend $100.oo on a real live christmas tree. The biggest display of consumer frenzy I’ve seen, however, was at the Craft Fair three weeks before Christmas. Pleasantly it was full of traditional items and art like mitts, kamiks, parkas, amautis, carvings, art, jewelery and ornaments from the college jewelery & metalwork program. In this sense, at least the money spent at the craft fair supports the continued development of traditional arts and skills, and stays largely within the community. There are over-the-top christmas light displays for the town lights contest (the prize was a round trip ticket to Ottawa, worth $1.5-2K!!!). There are plenty of parties, a santa claus parade, free Community Games all week, a Christmas concert/play, and if the bay had frozen, there would have been a Snowmobile Parade. There’s time off for sledding, skiing and snowshoeing, and fireworks for New Year’s Eve. Fun? Yep! Q) Zero Waste at Christmas? I managed to avoid a lot of food-related waste by doing a LOT of home cooking and baking (I even used my home-made cookie cutters). We are still producing the occasional non-reusable soft plastic scraps from grocery items, but that’s about it, and Christmas wasn’t much of an exception. We really don’t buy much else, so that slashes the non-food-garbage category (and our self-gifted new vaccuum cleaner came in very wise packaging with no foam and very little plastic). There is possibly an (enigma, conundrum, paradox, synergy?) of consumerism and zero waste up here. This is the great feeling I get from spending lots of cash . . . supporting traditional lifestyles and skills at the craft fair. One really important way of reducing waste associated with throwaway items and packaged, imported goods is certainly through traditional knowledge. The knowledge and pride of traditional skills can be kept fresh and alive in new generations instead of trying to convince ourselves to “go back” to it. Let’s avoid forgetting the ways of a balanced, self-sufficient lifestyle in the first place! Up here, true on-the-land life skills are only a few short generations removed from necessity, which is more than can be said for most urban and suburban southern Canadians. Valuing these skills, knowledge, and traditions is to value a way of life that was much more in balance with the natural world. Even if these skills are being used increasingly for tourism-related economies, they are still used day-to-day by people in northern communities; they are NOT tokens but practical, modern, relevant, and something to be proud of. Every pair of handmade kamiks is one less ‘made-in-china-from-coal-electricity-and-petroleum-products-with-cheap-labour-shipped-around-the-world-supported-by-massively-ecologically-inefficient-industry’ pair of boots. I sometimes feel like that is the real hope for a way out of the wastefulness of our modern world – remembering and celebrating the cultural history of living from the land in harmony with (and at the mercy of) nature. Maybe one day we’ll be brave and wise enough to get back to it. long live the mighty Kamik!